Shortly after a recent blog post, a few parents and I were discussing our experiences presenting Sikhi at our children’s school. One parent had an extremely positive experience when a Sikh Coalition presenter came to speak at her daughter’s elementary school. So much so, the presenter was asked to come back and speak to some of the other grades. As a child, I dreaded the first day of school. Not just because of the anxiety of being around new teachers and students, but that was usually the day my Dad accompanied me and would explain to my teacher in his quick three minute speech who Sikhs are and what I was wearing on my head. Some teachers were not quite sure what to do with this information, while others were very engaging and would share what they learned with the class. As difficult as it was to get through that introduction, it did come with a sense of relief, not only for that day but for the whole year. At that moment, everybody knew I was different, everybody knew I followed a religion that required a certain discipline. And because of that, I looked different…that was it! After that, people could befriend me, dislike me, or ignore me as they so chose – I really didn’t care. No matter how hard I could’ve tried, I would never look like the other kids, being different was something I simply had to accept. And years later, it was something I grew to love. So many of my friends throughout my school years struggled to find their identity and develop their sense of individuality, with my Sikhi – I didn’t even have to try! I believe these experiences over time have helped develop my self-confidence, and those few awkward moments every year where my father would educate my teacher played an important role in that. My sister and I were raised with the same Sikh values at home – but my parents never visited her classes, nor did they ever feel a need to explain to her teachers or other students that she was a Sikh. And why should they? Let’s be honest…those three minute talks with my teachers were not to promote Sikh Awareness, it was simply to convey enough understanding so I wouldn’t get bullied and want to come home and cut my hair. It wasn’t just my sister who missed out on that opportunity, but I would guess most girls in our community did not have that same “special handling” as so many of the boys did. I wonder what teachable moments were missed? What life lessons could’ve been learned? Sure, we all have struggles to overcome during our adolescence that help build character – it does need to be because of our faith or identity. But I feel the boys of our community get that extra support and encouragement by default, whereas the girls are often overlooked. As you can imagine, there are broader issues here, much of which goes back to the double-standards we see in our communities every day. 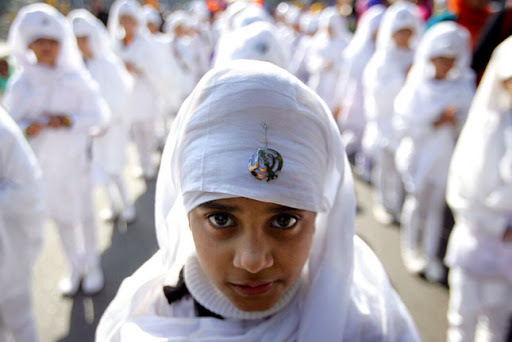 Young boys are praised and encouraged to wear a dastaar, but what about young girls? How many dastaar bandhis for Sikh girls/women have you attended? When a boy cuts his hair, the whole community is vigilant, asking “what should we do about the boys?” but a Sikh girl cutting her hair goes unnoticed. We all praise young children (boys and girls alike), when they reach milestones on their Sikhi – learn a new Shabad, memorize their paath, etc, – but how many of us encourage the teenage girl who’s aspiring to take Amrit? To be clear, I applaud how our community supports and encourages our young Singhs, but I must ask…how can we carry on that type of empowerment to our Kaurs? This is what I want every Kaur to feel…the sense of pride, history, and love that only the daughter of a King could feel.